Porcelain dolls were popular from the early 1800s to about 1880, and most were produced in Germany, France and Denmark. During the 1840s, the Germans began to mass-produce porcelain heads, allowing more dolls to be on the market. These dolls have less value than those that were handmade. Several indicators point to the value of a doll, including how it looks, to markings found on the doll. Check the condition of the doll. Look for missing fingers or chipped areas. Check the head, legs and arms then check the non-porcelain parts, to be sure they are original. Porcelain cracks with age, but does not detract from value. Large cracks or breaks that have been repaired, bring down the value of the doll. Look for painted eyes rather than glass eyes. Those with painted eyes were made in early production, before the dolls were mass-produced, and have more value. Examine the hair of the doll to see if it is the original hair. This makes the doll more valuable. Those with wigs of human hair are definitely more costly than those with synthetic hair, because they are older. Check the clothing on the doll. It is hard to find dolls with the original clothing. The clothing should reflect the time in which the doll was made, in order to raise the value of the doll. Inspect the doll to guess the age. Early dolls had painted eyes and faces, along with fabric or leather stuffed bodies or wooden bodies. Later dolls had jointed necks or limbs. Most early dolls were made in the likeness of an adult, but in the 1840s, baby dolls were made in France, and are extremely hard to find. Character dolls were made in Germany, in the later years, and are highly sought after. These dolls have expressions on their faces and are more valued than the mass-produced dolls. Look for manufacturer marks on the dolls. These may be numbers, letters or a combination of the two that can be linked back to catalogs, in order to find value of the doll. They are usually found on the backs or shoulders, or under the neck of the doll, although some can be found on the bottom of feet. There are many sites on the Internet where porcelain dolls and prices are found. Do a search to find the value of a doll, or receive advice from a qualified appraiser. 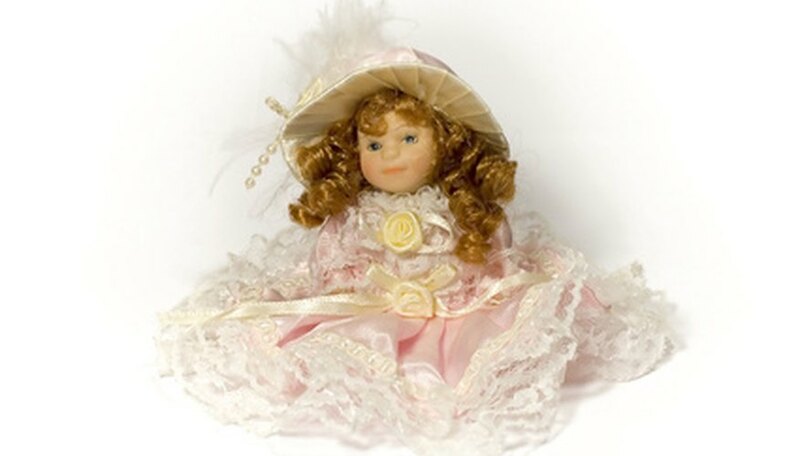 Dolls made during the Victorian era, in period dress, are extremely valuable and popular. Look under the wig for mold numbers, if they are not visible anywhere else. Not all dolls have markers or mold numbers. That does not mean they are not valuable. Take the doll to a reputable dealer that has a good track record, if information cannot be found any other way.